After 1885, special transformation equations were invented to algebraically describe the relative (translational) motions of inertial reference frames within Lange’s abstract model of Galileo’s Relativity, and to deduce, describe, measure and relate accelerations which occurred on one reference frame when viewed from the other. These equations yielded a composition of velocities and a translational invariance of accelerations. However, discoveries by Kaufmann and others after 1900 demonstrated that parts of these transformation equations might not be rigorously correct. “Suppose that we have two sets of variables and that whenever the values of the variables of the first set are specified, the values of those of the second set are determined, and conversely. A correspondence is thus established between the two sets of variables. The mathematical expression of this correspondence is called a transformation. It may happen that, to every choice of values for the variables of the first set, one and only one allotment of values follows for the variables of the second set; and it may happen that the reverse is also true. In this event the correspondence between the two sets is said to be “one-to-one’”(Ibid, p. 309). “In general, we find that the transformed points P′…lie along some [straight] line L′…[I]f we perform a [point] transformation and then follow it up with the inverse transformation, we shall merely undo what we have done” (D’Abro, 1939, p. 311). Algebraic transformations are not new. For example, they were used by Huygens in the 17th century and later by Ampere and Hamilton in the early 19th century (Ibid, pp. 318, 322). After 1885, special algebraic equations were devised in order to formalize the study of relative motions in Lange’s abstract model of Galileo’s Relativity and to give mathematical expression to his inertial reference frames. As previously mentioned, when two inertial reference frames (coordinate systems S and S′) were relatively at rest together in Lange’s relativistic model, their common position and common motion was geometrically illustrated as two inertial systems, S and S′, each with x, y, z coordinate axes located at their mutual zero coordinate position (Figure 14.1A). Algebraically, this stationary scenario was described as x = x′, y = y′, z = z′, t = t′. In 1909, Phillip Frank first referred to such equations as “Galilean transformation equations” (Pais, p. 140). Technically and mathematically, Frank was correct: such equations are “transformation equations.” However, for the non-pure mathematician his characterization was somewhat of a misnomer. As previously pointed out, so-called “Galilean transformation equations” are nothing more than simple “translation equations.” The only thing that they “transform” is the position of one event or experience that linearly translates from one position or frame to another. The only thing that they predict is that the magnitude of acceleration in one inertial frame will be measured by coordinates to be exactly the same magnitude of acceleration in the other inertial frame, and vice-versa (Figure 14.1). Why were these equations called “Galilean transformation equations?” Because, on their face, they appear to be nothing more than an algebraic method of describing the spatially separated positions and uniform velocities in Galileo’s Relativity: a ship at rest in port and a ship sailing uniformly away from port (Figure 5.3). Thus, these equations were named in honor of Galileo, but he did not invent them (French, p. 69). It is important to keep in mind that the results of the Galilean transformation equations always remained completely abstract, because the specific magnitudes of their algebraic variables were almost never stated. Most likely, these simplistic equations were seldom (if ever) applied to real life situations between 1885 and 1904. In fact, they only became important when Einstein used them in 1905 to describe certain mathematical difficulties that he perceived with the velocity of light (Chapter 19). “A frame of reference in space is usually defined by three mutually perpendicular axes along which spatial measurements are made. Consider two such frames moving relatively to each other with a uniform translational motion, and suppose that a body is moving with respect to both frames. If we refer the successive positions of the body to the first frame (i.e. if our measurements are made in the first frame), the body is found to be describing a certain path with a certain motion. As referred to the second frame, the path and motion will be different. A problem of frequent occurrence is to deduce the path and the motion relative to one frame when the path and motion in the other frame are known. More generally, we are required to establish a correlation between the space and time measurements performed in the two frames. The mathematical relations which determine the correlation are called a “space and time transformation.” To obtain them, we must perform space and time measurements in the two frames and then compare results. 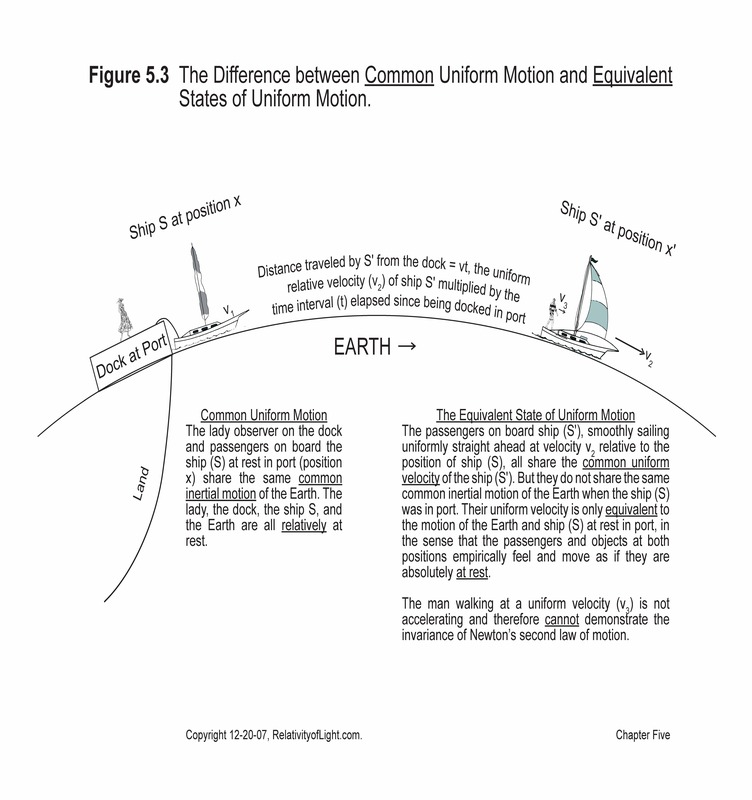 Commonsense, however, seems to obviate the necessity of direct measurement, for it appears to impose a definite transformation, called the Newtonian, or classical, space and time transformation. The commonsense feature of this classical transformation is revealed in any of its consequences, e.g., in the rule of composition of velocities. A simple illustration of this rule follows. “Let’s suppose that two frames are attached respectively to the earth and to a train moving along a straight track with a velocity v of 3 miles an hour. Suppose also a ball is rolling along the track with a constant velocity u of 5 miles an hour in the same direction as the train. Commonsense tells us that, with respect to the train, the ball should be moving with the velocity u – v (i.e., 5 – 3 = 2 miles an hour). This conclusion illustrates the rule of composition of velocities that are codirectional: they add and subtract like ordinary numbers” (D’Abro, 1939, pp. 429 – 430). “[In order to give Galileo’s Relativity] mathematical expression…we first note that if we apply the classical space and time transformation to the differential equations which express the laws of dynamics in one Galilean frame, we obtain thereby the laws such as they will appear in another Galilean frame. Now, when the classical transformation is applied to the equations of dynamics, these equations retain exactly the same mathematical form. In the language of the mathematician the differential equations of dynamics are “covariant” under the classical transformation. We here have the mathematical transcription of the fact that the classical laws of dynamics are the same regardless of the Galilean frame [velocity] in which they are expressed. Thus, the covariance of the dynamical equations constitutes the mathematical statement of the principle of relativity of Galileo and Newton. The foregoing considerations show that the classical laws of mechanics, the classical space and time transformation, and the Newtonian [or Galilean] principle of relativity are [mathematically] consistent” (Ibid, p. 431). In the above quotation, D’Abro was describing two very different types of so-called “covariance:” 1) the empirical and algebraic fact that for any acceleration occurring on any inertial frame, the magnitudes (F, m, a) always vary in such a way (covariantly) that the equation F = ma always describes such accelerations (Figure 4.4); and 2) the pure mathematical fact that the law of physics (equation F = ma) is invariant and does not algebraically change when we make a mathematical translation of our coordinates between inertial frames. In effect, the mathematicians were confusing their semantics. Classical “covariance” refers to variable magnitudes (i.e. F = ma) that vary in such a way that they continue to describe the same law or equation in any inertial frame. Classical “invariance” refers to laws and equations where the magnitudes are “covariant” in all different frames with different velocities. The distinction is real, not just esoteric or playing with words. “therefore we say that the laws of physics are symmetrical for translational displacements, symmetrical in the sense that the laws do not change when we make a translation of our coordinates” (Feynman, 1964, p. 11-3). However, this pure “mathematical principle of relativity” is only a mathematical conclusion that begs the physical question: is the law of physics or nature empirically the same in all inertial frames of reference (Chapters 23 and 24)? Only a physical experiment can answer this question. In 1905, as the foundation for his Special Theory, Einstein would invalidly generalize Galileo’s empirical concept of relativity and the above second type of so-called mathematical covariance (the mathematical “principle of relativity”) to include any law of nature (not just F = ma) and specifically to include his so-called law for the “propagation velocity of light at c.” However, as we shall later demonstrate, Galileo’s empirical concept of relativity is completely irrelevant to the correct law of the transmission velocity of light at c (Chapter 24), and there is no law for the propagation velocity of light at c. No such propagation law exists (Chapters 19, 21 and 22). “[I]n view of the smallness of the velocities [which the founders of mechanics had] at their disposal, their commonsense would have been vindicated by their measurements; nothing in the field of their experience could have suggested the inappropriateness of the classical transformation. Small wonder then that the transformation was assumed to be valid, however great the relative velocity between the two frames” (Ibid). The reason for D’Abro’s attempted qualification is explained in the next paragraph. During the period from 1901 through 1904, European scientists Kaufmann, Abraham, Lorentz, and Bucherer discovered a new phenomenon. As EM energy is applied to accelerate an object or particle to greater velocities, the “electromagnetic mass” of the object tends to increase (Chapter 17). Therefore, the electromagnetic mass of an object (i.e. an electron) abstractly accelerated on Lange’s inertial reference frames should also increase at greater velocities. For this reason, D’Abro asserted that “the classical [Galilean] transformation becomes increasingly incorrect when the relative velocity of the two frames is increased” (D’Abro, 1939, p. 430). “It was the recognition of this fact which constituted the starting point of the special theory of relativity. The original aim of the relativity theory was to discover the amended transformation which would supersede the classical one” (Ibid). Despite D’Abro’s above assertions, the following questions remain: is the increase in “electromagnetic mass” the same phenomenon as an increase in the material mass of an object? The short answer is “no.” Is there an easy way to reconcile this mathematical problem? The answer is “yes” (Chapter 17). We shall analyze and discuss these and similar subjects in great detail later on. The only relevance between Galileo’s Relativity and the Galilean transformation equations, were that the Galilean transformation equations mathematically demonstrated that: 1) the positions of the two inertial frames, (x′ = x – vt) and its reciprocal (x = x′ + vt), were spatially separated by a distance (vt); and 2) that one frame translated relative to the other frame. 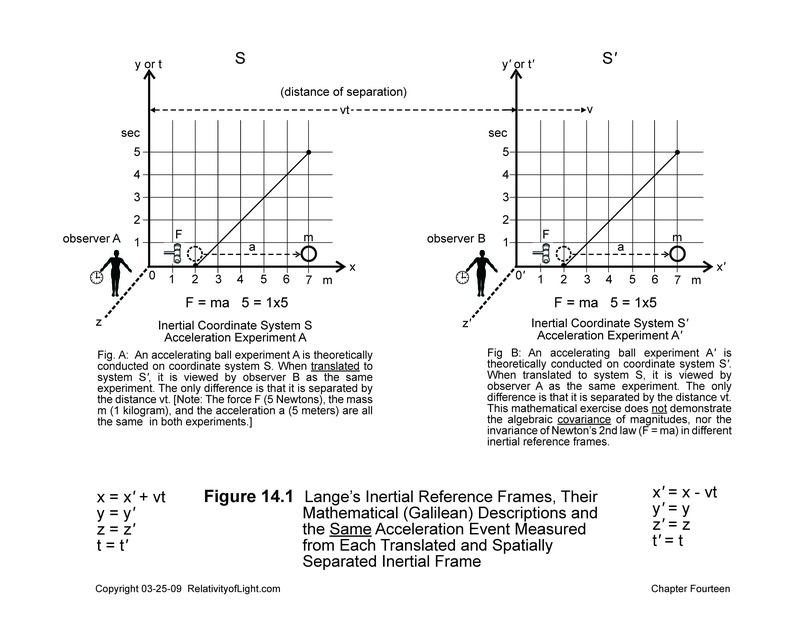 The Galilean transformation equations could not demonstrate that Lange’s inertial frames were sensorally and empirically equivalent. The specific positions of such frames (the specific relative distance traveled, vt) and the specific numerical magnitude of the abstract relative velocity v of the inertial frames (i.e. a train moving constantly at 3 mph) were all irrelevant to the limited purposes of Galileo’s Relativity. The velocity of a body (i.e. a ball) moving constantly along at 5 mph relative to the train was also irrelevant to the limited purposes of Galileo’s Relativity, because such inertial motion was not accelerated. The unaccelerated uniform motion of the ball could not demonstrate the empirical covariance of Newton’s second law with different variables of F = ma. Nor could it empirically demonstrate that different accelerated motions appeared to act exactly the same way in each spatially separated inertial frame. On the other hand, such specific positions, distances and magnitudes of velocity v were not irrelevant to the mathematical measurement purposes of the Galilean transformation equations. For purposes of describing, computing and measuring uniform relative motions, the velocity of the uniformly moving ball could abstractly be added to or subtracted from the velocity of the train. The Galilean transformation equations could also abstractly and mathematically determine by coordinate measurement whether a body situated on one inertial frame or the other was accelerating relative to such inertial frame. where (v) is the relative speed of the two inertial frames, (u) is the uniform velocity of one inertial frame and (w) is the uniform velocity of the other inertial frame. These derived equations were at some point in time referred to as the Galilean or “classical addition of velocities” (Goldberg, pp. 76 – 77), or ”composition of velocities” (D’Abro, 1939, p. 430). The ”classical addition of velocities” states “that the velocity measured in the two frames of reference in any direction will be the sum or difference of the velocity measured in one frame and the relative velocity between the frames” (Goldberg, pp. 373 – 374). With such relative velocities it could algebraically be determined from one reference frame whether an object of mass m in the other reference frame was accelerating, because the measured linear relative velocity of the object would vary over time. If so, the abstract algebraic magnitude of such acceleration over time could also be derived. From these calculations the force F applied to the known mass m at each time interval could also be abstractly determined. It was then asserted that the resulting data would theoretically show that, as viewed from each inertial frame, both fictional observers would have to agree that the same resulting acceleration was in proportion to F = ma in both inertial frames (Goldberg, pp. 80 – 81). That is, it was asserted that such transformation equations would demonstrate that hypothetical observers in both inertial frames should agree that the coordinates and values for such acceleration were algebraically described by Newton’s second law (F = ma) (Figure 14.1). In other words, that such identical accelerated motions were mathematically “covariant” in both frames, and that Newton’s second law (F = ma) was mathematically “invariant” in both inertial frames (D’Abro, 1939, p. 431). However, this very limited type of “translational covariance” vis. that the same coordinates with the same magnitudes for F = ma resulted in the same acceleration when translated between two different inertial frames (positions), could not and did not demonstrate the empirical or algebraic covariance of F = ma. At most, such empirical and algebraic covariance was inferred. This translation scenario did not even mathematically demonstrate that Newton’s second law of motion with different variables for F = ma was “invariant” in all inertial frames. The algebraic covariance of F, m and a in any frame, and the invariance of F = ma in any two frames, could only be mathematically demonstrated (rather than inferred) where different coordinates with different variable magnitudes for F, m and a resulted in different accelerations (motions) in any inertial frame, but all accelerations retained the same algebraic form (F = ma) for Newton’s second law in any inertial frame. 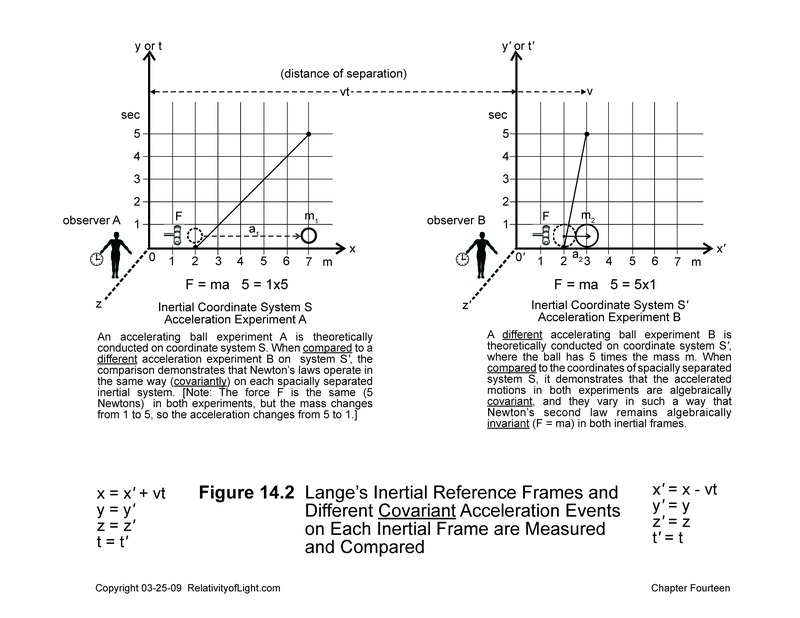 In other words, where two different acceleration experiments are compared (Figure 14.2). It becomes obvious from the above discussions that the Galilean transformation equations had almost nothing to do with Galileo’s Relativity. Like Lange’s inertial reference frames, the Galilean transformations constituted an entirely different concept created for completely different purposes: measurements. Galileo’s Relativity had nothing to do with measurements, whereas the only purposes for the Galilean transformation equations were measurements. With respect to the Galilean transformation equations for time, t = t′ and t′ = t, the instant in “time” of each event on each inertial reference frame was not assigned a different magnitude nor did it participate in such mathematical demonstration of translational covariance, because it was incorrectly assumed by some pure mathematicians that all instants in time were the same for every observer (Chapter 26). The only variation of time applied by the Galilean transformation equations was the time interval (t) in the symbol for distance traveled (vt). However, in 1905, Einstein correctly pointed out to his fellow mathematicians that the instant that a distant light event actually occurs is not the same instant in time that it is perceived by a local observer. The reason for this conclusion is the fact that there is distance/time interval delay of the finite light signal transmitting at c, and that this “time interval delay” for distant events was not normally realized nor factored into measurements by pure mathematicians (Chapter 26). For this reason, the Galilean transformation equations for time were not rigorously correct for mathematical measurements. Nevertheless, such specific mathematical measurements of instants in time had nothing to do with Galileo’s Relativity. The “mass” of each accelerated body was not assigned a magnitude in the Galilean transformation equations, because it was assumed by everyone before 1901 that “mass” is an invariant property of the object and is always the same, regardless of the energy applied to it to increase its velocity (Chapters 17 and 31). For this reason, the Galilean transformation equations were not rigorously correct, at least for electromagnetic mass. Measurements of any kind of mass had almost nothing to do with Galileo’s Relativity. The length of each accelerating body located on Lange’s inertial reference frames was not changed by the Galilean transformation equations, because it was correctly assumed that length is an invariant physical property of the object and is always physically the same in every inertial reference frame regardless of its velocity. Nevertheless, the measurement of length had nothing to do with Galileo’s Relativity. Let us now summarize the shortcomings of the Galilean transformation equations. First, they had almost nothing to do with Galileo’s Relativity. Second, their translational covariance did not demonstrate the empirical and algebraic covariance of different magnitudes of F, m or a, nor the empirical invariance of Newton’s second law in different inertial frames. Third, they did not correctly mathematically describe the instant in time for each observer’s coordinate measurements. This deficiency could easily have been rectified by modifying the Galilean transformation equations for time as follows: t = t′ + ct and t′ = t – ct. Fourth, the material mass of an object may vary in each different inertial frame, but not for any reason described in this chapter (Chapters 31 and 32). In addition to the above, Einstein (in 1905) claimed that the so-called propagation velocity of light at c was not correctly described by the Galilean transformation equations and that only the Lorentz transformations could correctly describe this absolute velocity. In Chapters 21 and 22 we shall demonstrate why Einstein’s claims with regard to the impossible absolute velocity of light at velocity c are not valid (see the Preamble). In order to remain consistent with his assertions concerning the absolute velocity of light at c, Einstein (in 1905) also asserted that the length of a body contracts and the time interval on such body expands depending upon the magnitude of such body’s relative velocity v as compared with the velocity of light at c, and that the Galilean transformations did not correctly describe these phenomena. We will analyze and discuss these assertions in Chapters 26 and 28, demonstrate why such theoretical phenomena are only mathematical illusions caused by Einstein’s bizarre methods of measurement, and why such mathematical phenomena do not exist. By this point in time we should better understand D’Abro’s earlier assertion that “the original aim of [Einstein’s] relativity theory was to discover the amended transformation which would supercede the classical one” (D’Abro, 1939, p. 430). However, such amended transformation (the “Lorentz transformation”) was not only invented to mathematically approximate the theoretical increase in an electron’s electromagnetic mass with its increase in velocity. It was also invented and applied for several other purposes, inter alia, 1) to mathematically describe the correct time coordinates of a light event, 2) to mathematically describe the propagation (not the transmission) velocity of light, and 3) to mathematically demonstrate that the length of a material body contracts and that the time interval on such body expands (goes slower) depending upon the magnitude of such body’s relative velocity v as compared with the velocity of light at c. It is a major purpose of this book to demonstrate (step by step) how, why, and the extent to which Einstein failed in all of such endeavors. Based upon his above described agenda, Einstein asserted (in 1905) that the Galilean transformation (translation) equations were invalid and that a new radical set of point transformation equations (called the Lorentz transformations) must be substituted in their place. This substitution was not just a pure mathematical exercise that amended the Galilean transformations. It resulted in a myriad of mathematical consequences that have been interpreted literally as physical consequences. These invalid literal interpretations have theoretically changed much of physics. A few of the many daunting questions that we will begin to explore in the next chapter are stated as follows: was there any validity to Fitzgerald’s, Lorentz’s and Einstein’s contraction of matter concepts? What (if any) was the inherent validity of the Lorentz transformations? What empirical criteria (if any) were they based on? Was such radical substitution of transformation equations in any way necessary or empirically valid with respect to the velocity of light, the contraction of material bodies or the dilation (slowing down) of time? Should the purely mathematical consequences of the Lorentz transformations be interpreted literally as real physical consequences? Should the Lorentz transformations have changed much of physics?